You know about the Cynwyd Heritage Trail in Lower Merion Township; right? And how the much-anticipated trail on top of the Manayunk Bridge will extend that trail over the Schuylkill River? Well, the Ivy Ridge Trail is the third piece of that trail, extending a wide, paved route to the Ivy Ridge Station. 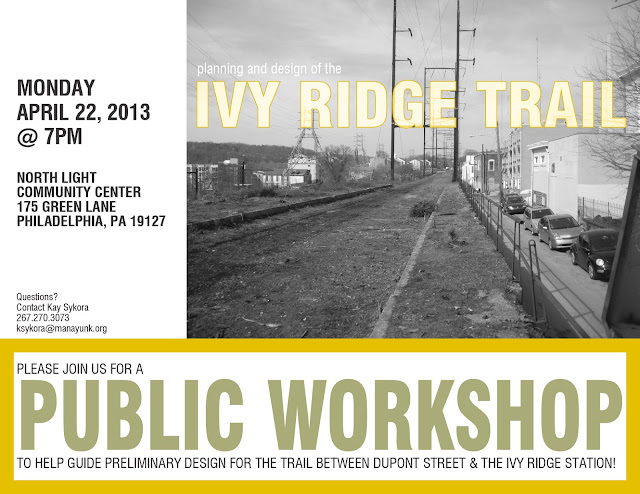 Trail enthusiasts and interested neighbors can learn more about the Ivy Ridge Trail's design and timeframe at a public workshop on Monday. Another piece of The Circuit coming into focus!